According to the latest market study by The NPD Group, the average monthly pay-TV subscription fee for basic pay-TV service and premium-TV channels in the U.S. has reached $86 in 2011. As channel licensing fees continue to rise, pay-TV subscriber rates have grown an average of 6 percent per year -- while American consumer household income remained flat. 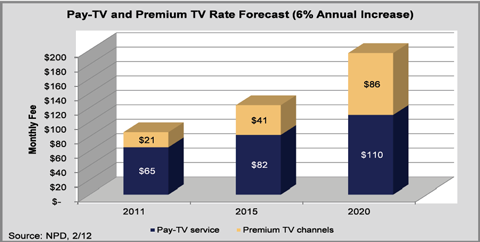 If nothing changes, NPD forecasts that the average pay-TV monthly payment will reach $123 by the year 2015 and $200 by 2020. I've previously reported about the U.S. sports networks, ESPN in particular, and how they're a significant part of the rising costs problem for all pay-TV service providers. The forced bundling of these high-cost channels merely aggravates the situation -- because a-la-carte channel selection is not an option. According to the findings from NPD’s recent study, 16 percent of U.S. households do not subscribe to pay-TV services. Moreover, the recent U.S. economic troubles have resulted in five million fewer American households subscribing to pay-TV services -- which are already considered a luxury item by some people. To date, the total pay-TV subscriptions in the U.S. have not declined much, due to bulk-service pay-TV contracts with apartment complexes and home owners associations that have allowed pay-TV operators to retain subscriptions in vacant homes. "As pay-TV costs rise and consumer spending power stays flat, the traditional affiliate-fee business model for pay-TV companies appears to be unsustainable in the long term,” said Keith Nissen, research director for The NPD Group. “Much needed structural changes to the pay-TV industry will not happen quickly or easily; however, the emerging competition between S-VOD and premium-TV suppliers might be the spark that ignites the necessary business-model transformation of the pay-TV industry." Based on other market studies by NPD, the growing phenomenon of pay-TV "cord cutters" who reported cancelling their subscriptions is primarily driven by economic considerations -- the perceived low-value for the subscription high-price. However, some consumers are still accessing TV content from free-to-air broadcasts, free streaming TV via the Internet, as well as via lower-priced subscription video-on-demand (S-VOD) services, such as Netflix. "Despite the plethora of over-the-top (OTT) options for movies and TV, most consumers want their pay-TV providers to be central and relevant to the acquisition and viewing experience," said Russ Crupnick, senior vice president of industry analysis for The NPD Group. In fact, 59 percent of pay-TV subscribers preferred having one single provider for their pay-TV services, compared to 21 percent who desired multiple providers, and 21 percent who expressed no preference. Sixty-two percent of subscribers wanted premium TV either delivered by their pay-TV provider directly, or from a service affiliated with their pay-TV provider. Only 20 percent of pay-TV subscribers were likely to cancel their pay-TV service, if they could get their favorite shows online. Of course, given the track record of perpetual subscription price increases, that scenario is subject to change -- everyone has their limit, where they will refuse to pay yet another increase. "Pay-TV providers offer a convenient, one-stop shop for subscribers, and the majority of customers like it that way," said Crupnick. "There is an open window for the industry to meet consumer needs and become to television what iTunes is to music; however, there is also a definite risk if pay-TV providers don't capitalize on the opportunity -- and soon."